The forecast called for extraordinary precipitation on California's Sierra Nevada. A week later, the region has seen more than 20 feet of snow, severe rains, flooding, and even more snow. This is one skier's account from the epicenter, Mammoth Mountain. See the storm through a local’s eyes in the first two installments. The hook for this story was always the numbers: 20 feet from one storm cycle has a nice ring to it. And the numbers are on track—Mammoth is reporting another 60 to 100 inches in the last 48 hours, which makes the total for this cycle so far from eight to 14 feet, with accumulations in deposition zones up high on the resort totaling well over 20 feet. The higher-elevation Tahoe resorts are reporting slightly lower but proportional amounts. Sunday night was one of the very few times that I’ve really had to reflect if I was ready for a multi-day power failure, to make sure I had enough food and dry wood to survive the storm. By and large, the Sierra seems to have scraped it out by the skin of our teeth. There has been some significant flooding, especially in the Reno area, but the high mark just barely failed to reach the level that prompted emergency flooding all over the region, like Yosemite, where the Park Service evacuated and shut ‘er down. A lower-than-forecasted snow level was the hero there, and for skiing. Temperatures in Mammoth jump seven degrees almost instantaneously but the snowfall continues, heavy at times—18 inches or so at Mammoth’s 9,000-foot-elevation Main Lodge by midnight, and probably closer to three feet on the summit from today. At one point, around 8 o’clock, the snow grows in intensity and suddenly switches to giant flakes. The snowflakes are almost all about an inch across, falling so thick they can’t get out of their own way to hit the ground, sometimes colliding and melding together to form big feathers of clumpy lace that land with a splat. This phase runs for about an hour; it’s snowing at near maximum intensity in town, and I can’t imagine what’s happening up on the ski area. The day starts appropriately with thunder and lightning and goes from there, dropping copious rain and snow as we dig out yet again. Mammoth Mountain is reporting another 24 to 48 inches, bringing their total from seven to 12 feet out of round one before the rain started in town. The entire mountain is closed, and town is a mess with some of the creeks and low-lying areas already flooding. But so far the rain line has stayed lower than expected, hovering near 8,500 feet. Snow through the morning stacks up another eight inches in town before the first raindrops fall around noon. Localized flooding begins almost immediately, though without any real consequences. But despite temperatures above freezing it begins to snow again, and by 5 o’clock it is literally hammering, snowing for more than an hour as hard as the laws of physics allow before moderating to merely dumping. The streets are now a total mess, demanding a high-clearance four-wheel-drive vehicle, preferably with chains. During this period it snows almost 15 inches in less than three hours at 9,000 feet. It snows almost 15 inches in less than three hours at 9,000 feet. 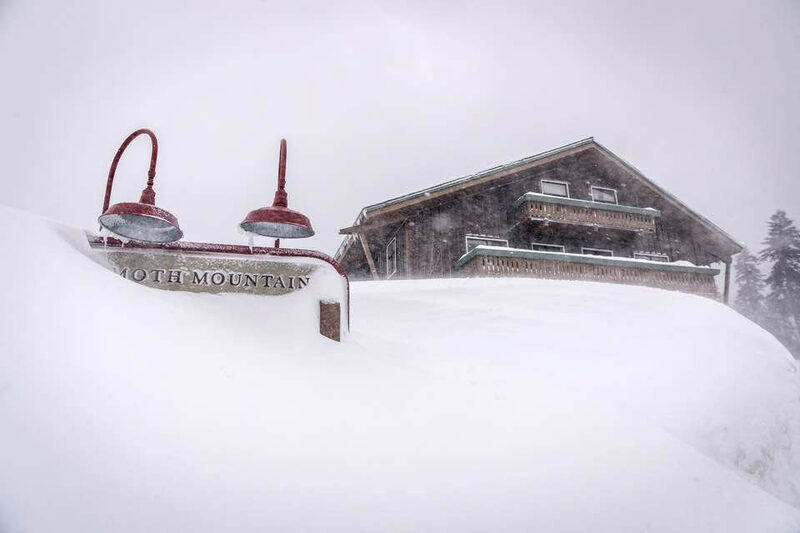 Mammoth Mountain is completely closed today, I think for the first time in at least 20 years. The Town of Mammoth Lakes, the county, the CHP, and every other relevant institution were unanimous in calling for people just to stay the hell at home and advising them of where to obtain sandbags. 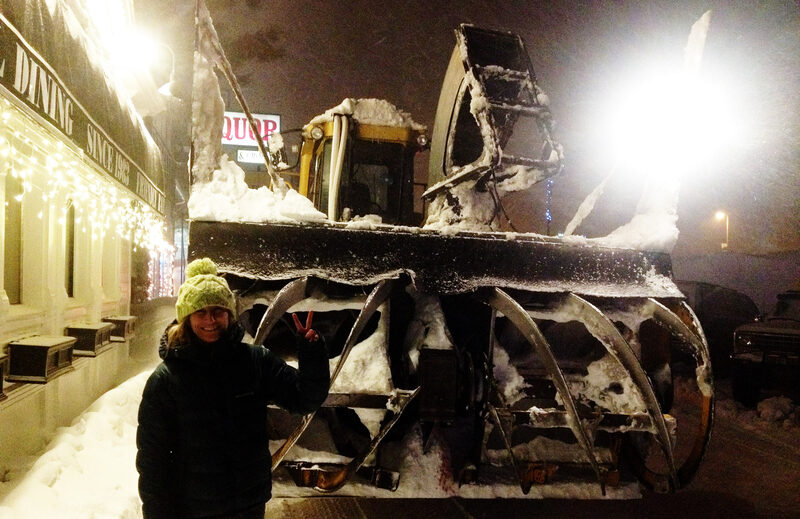 In Tahoe, the avalanche center took the unprecedented (? ), and I think totally appropriate step of declaring the Hazard Level on all aspects and elevations to be a six… on a five-point scale. There have been numerous highway closures and accidents on pretty much every major roadway from 80 to 50 to 395. The Truckee river is coming dangerously close to flooding downtown Reno. By nine o’clock the snow gives way to rain in town again, a particular delight as I shovel out a car for the third time today. Two complete sets of “waterproof” outerwear soaked through, shovels cracking from the strain of moving thousands of pounds of the wettest muck possible… and I now have snow-shoveling blisters. So far this storm has maintained lower snow levels than predicted—a good thing for the flood situation here in California and Nevada, but dizzying when you think about how much snow is piling up in the high country while we’re getting mixed rain and snow. With the current snowfall rates up high, it’s totally possible that the mountain might see another three to five feet overnight. Strong winds and it’s just pouring rain. The snowpack has already declined around my house. Temperatures are 36 in town, 32 at Main Lodge, and it’s still snowing very hard up there. It look’s like there’s another 16 inches at Main Lodge on top of about that much from Saturday. That’s roughly 80 to 130 inches of snowfall, from 9,000 to 11,000 feet at the halfway mark for this atmospheric river event. The snow is cold, relatively fluffy, and quickly forming huge drifts around all the berms and snowbanks that are beginning to turn the streets in town into a high-walled maze. It’s much colder now and the skies are cloudy but the incoming storm pulse isn’t here yet, so we have another window to dig out before the next, colder phase of this storm cycle moves in this afternoon. Though yesterday’s storm was indeed gnarly, Mammoth seems to have avoided the high snow levels that could have caused flooding in town. The end result is another really solid (literally, as well as metaphorically) snowfall on the ski area, which is reporting 41 to 84 inches of very high-density snow from this round. Given the deposition that must have come with hours of 80-plus mph winds, the ski patrol is no doubt looking forward to another huge round of avalanche control and raising tower pads. A little pre-frontal squall line of wind and dumping snow rips through town to announce Phase Three of the storm cycle. If the temps stay where they are now (+/- 25 degrees in town) this is going to be a Powder Event. Which is indeed what NOAA is forecasting, predicting much lower overall snow levels. There could be some incredible skiing out in the Sierra backcountry after all this, but the big question remains the snowpack: What the hell will we be dealing with when it finally stops? We’ll be getting our money’s worth out of the local avalanche center, that’s for sure. While this storm cycle hasn’t been anything crazy yet, it feels as big as anything I ever experienced during the most massive recent winters—’98, 2005, 2006, and 2011. Dumping. Just dumping. With temps in the 20s, the wind is ripping bands of whiteout curtains through town, and the snow is cold, relatively fluffy, and quickly forming huge drifts around all the berms and snowbanks that are beginning to turn the streets in town into a high-walled maze. The wind gauge on the summit has failed, but the anemometer on top of Chair 22 is showing an average wind speed of over 90 miles per hour for over an hour straight, with many 120 to 130 mph gusts. About 150 to 160 mph is a reasonable estimate for peak wind gusts at the summit. With that kind of wind loading it’s quite likely there with be multiple natural avalanche cycles beneath the ridge tops overnight. The rest of the week promises more, you guessed it, snow. Round three of the Hydrological Hammering was supposed to peak Tuesday evening and continue through Thursday. The forecast is calling for another three or more feet in town and six to 10 on the ski hill. While this storm cycle hasn’t been anything crazy yet, it feels as big as anything I ever experienced during the most massive recent winters—’98, 2005, 2006, and 2011. Whatever else happens this winter, the Hammering has stacked up a huge base in California and it’s finishing with feet of cold powder.